You are here: Home » Be Angry! America’s electorate is as diverse and fragmented as almost any time in our nation’s history. There are groups divided by race, ethnicity, sexual preference, culture, education, differences in views on abortion, gun rights and responsibilities, and many other issues. Divide and conquer is nothing new, but never has it been so writ large across our country’s landscape. Fueling these divisions is an underlying, yet powerful, amount of anger and frustration. This manifests itself in ugly feelings of intolerance, bigotry, class rivalry, and racism on display across our country. There are even those begrudging their fellow citizens of their constitutionally protected First Amendment Right to free speech with counter-protests and violence. America’s institutions are under attack like never before, as the social safety net gets thinner and weaker all the time. We’ve been told we can’t trust the Federal Bureau of Investigation, we’ve seen local law enforcement constantly being ridiculed and scrutinized in nationally publicized tragedies that get little right except the victims names and age. The housing crisis told us we can’t trust banks, and the most recent recession proved that Wall Street isn’t trustworthy either. Our teachers have quietly weathered the erosion and dismantlement of the public school system without pay raises and even cuts in their pension and retirement as the same spiraling healthcare costs eats away at the little job security they once enjoyed. The American Dream of getting rich quick was replaced by an economic model of suffering thirty to forty years of penal servitude, under incompetent managers and petty bosses who are too stupid to realize that they too are caught in the same trap as yourself. All of this was worth it because the light at the end of the tunnel was a pension and retirement. Here we are, almost thirty years later, and we still have the same incompetent bosses and petty game playing managers but what’s gone is the sense of security and that brass ring of retiring comfortably and with dignity. Those American households that are lucky enough to have both a father and mother still have both parents working while teachers raise their kids, with no authority or mandate, and TV and video games fill up the time at home. Unions are especially sensitive to these effects. While union workers are regularly stereotyped as lazy and ungrateful, the real truth is that union members are better informed and painfully aware of the precarious situation facing workers. Union members are usually more well versed on WHY and HOW unions came to be, and the REAL and often bloody sacrifices that workers paid to form them. 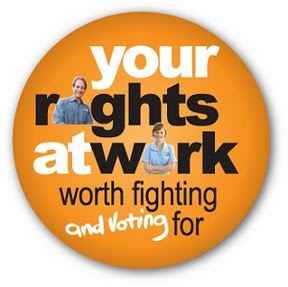 They speak out because they can, confident in the union to protect their rights. They speak out for ALL workers. They set the bar. There’s no doubt that this is why the labor movement is a prime target of those destroying the middle class . The same ones pushing “Right To Work” and trying to cripple and dismantle the National Labor Relations Board and weaken, or even get rid of the National Labor Relations Act have weaponized the anxiety and fears of working people and are using it to further the agenda of making corporations stronger and governmental oversight and regulation weaker. It’s an easy thing to churn out propaganda under covert 501(C) groups with secret donor lists, buy politicians, fund massive campaigns, and hire slick talking heads and time for them on the airwaves, and wrap themselves patriotically in the flag or hide behind the Holy Bible; whatever it takes to fan the flames of people’s prejudices,; whatever it takes to direct the anger of workers to each other instead of the architects of chaos. The hard truth is that anybody who works for a living has more in common with each other than they do with pampered corrupt politicians, the very rich, or the lawyers and P.R. people they have working for them, yet many choose to forgo the power that unified action gives them by being distracted by those feeding and manipulating their fears for their own advantage. Solidarity seems an archaic, even foreign, word. It should, since unions have a long history and are worldwide. There are some countries that being a union organizer is more dangerous than being a militant or a drug trafficker. Organizers and union officers are regularly harassed and even executed in many societies across the globe, just like they were in our country over 90 years ago. It has taken that long for working people to forget or take for granted what organized labor is doing or has done for them. That opened the door for the unscrupulous profiteers to do some organizing, having learned the lessons of the battles between themselves and labor. This isn’t a liberal versus conservative thing, or a Republicans against the Democrats contest; it’s not even an older generation versus generation “X” or “Y” conflict, or native born versus immigrant. This is an American thing! So be angry, speak out, stand up, but most of all remember what it is that makes us Americans. ← Your Union Officers Updated!